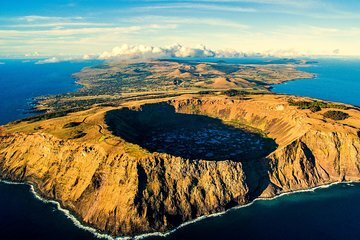 Avoid overcrowded Easter Island tours with this private tour of the island that includes round-trip transport from your hotel. It’s perfect for travelers short on time because it packs in a ton of highlights in just one day. See Vinapu, Ahu Akivi, and Rano Kau, Puna Pau quarry, Orongo, and the Ana Kai Tangata cave. A guide tells you historical stories as you go, including a unique tale about cannibalism. Our tour was really awesome. He was able to give us all the information we needed to really make the tour interesting. This trip was better than our highly expected expectations. Our guide was of one of the cultural mone important family with roots back in ancient time.As a native he gave us important information nof ancient and present living on the Island. He showed us the quary where the big stone statues were made and how they were transported. We also saw the Place where the first chief landed and where the fist native Child was borne. We looked at old houses and how they were built as an upp-side down kanoe. I Think this was one of the best guided tours I ever have taken part in. Our guide Mark is so knowledgeable about this beautiful island and its customs, he is a walking encyclopedia, lots of fun. We felt like this tour was custom made for us as being a private tour we were the only participants. It was simply wonderful, stunning views and so many surprises. I loved that Mark took photos of us at varying angles to give us a unique experience. We saw all the highlights, everything one would expect to see but then there was so much more, just simply a tour not to be missed.